Rostec today announced that its subsidiary company Russian Helicopters is close to signing a long-term maintenance agreement with the Indian Ministry of Defence (MoD) to provide after-sales service for entire Indian fleet of Mi-17 helicopters. This long-term maintenance agreement will be for the entire life-cycle of the fleet and marks a shift from the earlier approach provision of after-sales support. According to the preliminary agreement, Russian Helicopters will provide repairs for the Mi-17 fleet and also supply spares throughout the entire lifecycle of the rotorcraft. 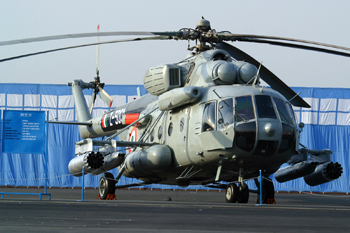 Repairs of helicopters operated in India will be performed by enterprises that are part of Russian Helicopters. The current contract life-cycle is expected to be three to five years. A further extension, as well as expansion of helicopter models covered by the after-sales support system is part of the plan and is being considered. Rostec State Corporation also announced that it is showcasing Verba, the world’s most advanced man-portable air-defence missile systems (MANPADS) for the first time outside of Russia. This initiates the active promotion of Verba in the international markets. Verba has been designed and manufactured by KBM Scientific Production Concern, a part of JSC High Precision Weapons. Presently, Verba MANPADS is just entering into service with the Russian Army. Rostec State Corporation holding company, United Instrument Manufacturing Corporation, also presented a mobile fire control unit, designed for the operational control of the actions of forces armed with portable anti-aircraft missile systems, including Verba.